This Marimekko-style print dress is rapidly becoming a favourite, and it’s only just starting to show some signs of warmer weather in Melbourne. I’m ridiculously, eternally grateful to Rachel for sending it to me. I’m looking forward to days when I can wear it without a cardigan over the top, and I’m also on the hunt for a belt for that eventuality. Green do you think? Or blue? I like it with the bright yellow from the last time I wore it but it would be nice to have something different, too. There’s actually an honest-to-goodness Marimekko shop opening up in Melbourne in a few week (excitement!) and they’ll be carrying the clothing range. I’m too scared to google the prices, but from memory they actually do a few items in larger sizes – hurrah! – and I love Marimekko home wares, so I’ll probably be there with bells on the moment the doors open. 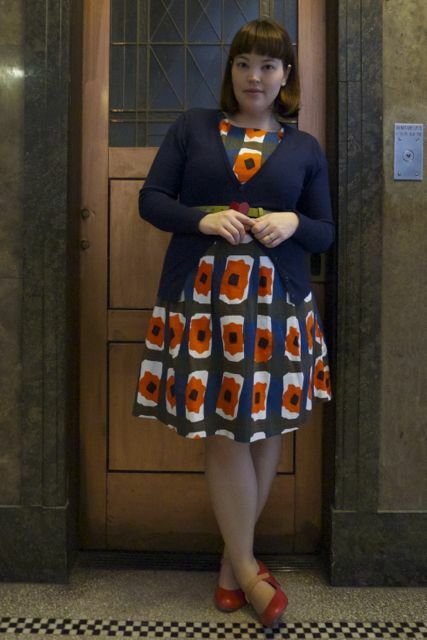 This entry was posted in Uncategorized and tagged cardigan, Chie Mihara, cocolatte, cool, dress, wallis by lillipilli. Bookmark the permalink. What a beautiful dress and how wonderful to have it gifted! My dress selection has reduced a lot recently. I’m sure once winter hits it’ll go up again but at the moment I have about six much loved dresses hanging in the wardrobe which I can’t say are even being worn that much. Do you find that? It looks like the print is orange with a touch of red- a nice red belt? 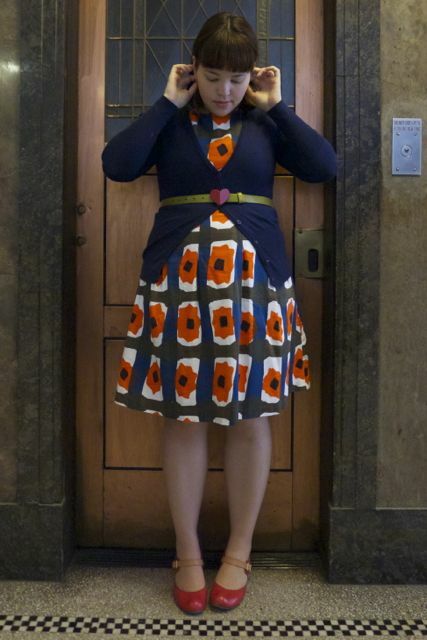 Love this combo-think you have the prints and colors down pat- pretty funky and so styling! Looks gorgeous and fresh! So cute! I really love that print. What about a white belt? I got one from Retrostar that served me well with my dresses and I love the way it looks. I really love that orange and blue combination! I am SO in love with this dress on you! The print & fit are just spot on. I agree that a white belt would be super cute, & green (a springy, apple green) would also be a snazzy pop. Or maybe a turquoise or peacock blue? In my experience Marimekko has very generous sizing. They do plus sizes too on some items, but even the basic stuff goes up to either EU44 or EU46 (or XL/XXL) which is probably going to fit you, since as I mentioned, the sizes are usually generous. Let me know! That being said, I can’t imagine what the imported prices will be over there, since they’re very much out of my price range over here in Finland, where Marimekko originates. Yikes. 😀 Makes me giddy that you like them though! The dress is fantastic!! It’s such a great cut on you. We are heading into fall here and I am looking for wrap dresses to wear with tights and boots and cardigans, lol. I do love a dress that I can wear all seasons! You look beautiful! Oh my, I love your dress a ridiculous amount! SO CUTE! 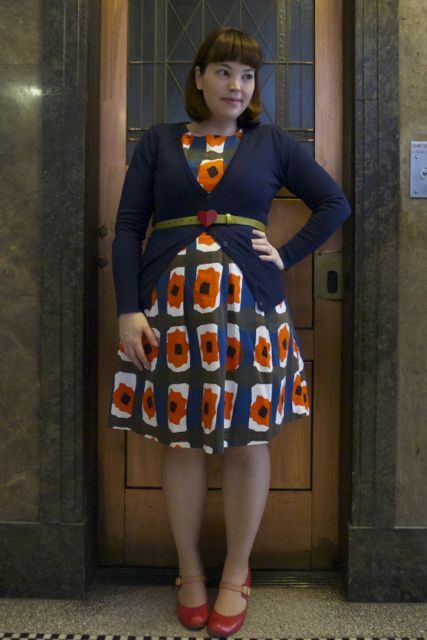 And I love the way you’ve styled it with the cardigan, belt, and Chie Mihara shoes. I have such a thing for Chies! Here’s another pair I think would look great with your dress—hopefully, it wouldn’t look too matchy-matchy. I think the contrast of the graphic floral in the dress with the slight ode to menswear in the heeled oxford would be fab!